Pixies' Frank Black is in he dark - literally. Speaking to MusicRadar from his tour bus en route to a solo acoustic show, he's holed up in his son's bunk, and he's pulled the curtains shut. "I'm in a dark bunk," he says. "I can tap into my id here...give you what you want." Giving the legion of Pixies fans - who have only grown in number following the band's breakup in the early '90s and have remained faithful since their reunion in 2004 - what they want is what Black and the rest of the group (bassist Kim Deal, lead guitarist Joey Santiago and drummer Dave Lovering) have been doing at knock-out festival shows recently. And with a just-announced (and quickly sold-out) string of European dates coming in August, Pixies will be surely pleasing the multitudes once again. It's a good time for the famously troubled band, whose tensions seem to have abated. But on the subject of recording a new album, Black appears to draw the line. "As far as any new Pixies records, I'm literally in the dark," he says, repeating his line both metaphoricaly and quite literally. 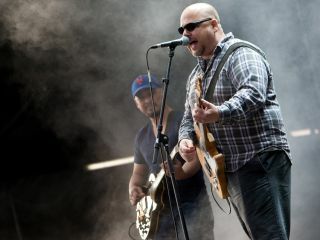 Playing big money Pixies shows and dishing out the group's impressive repertoire pleases Black to no end (the money part especially), but when it comes to a new album, the singer-guitarist says, "At this stage of the game, we're not trying to reinterpret the music. We're more about replicating records and replicating certain expectations rather than getting all jazzed about it." Which is another way of saying, "Don't hold your breath for a new Pixies album." Black is well aware of the band's legacy, and in this exclusive MusicRadar podcast, the revered frontman is voluable when discussing their much-imitated sound. It's a dynamic that will be on grand display on the upcoming (and big-ticket priced) boxset Minotaur, which Black says is as much a testament to the Pixies' early recordings as it is the photography and artwork by Vaughan Oliver and Simon Larbalestier that graced those seminal albums. Click on the podcast below and listen as Frank Black dissects the intricacies of the Pixies' aesthetic, his guitars and why he hates beach balls and inflatable sharks at festival shows. He's a one-of-a-kind guy, and proves it here.